The project is for a Yard (as both an architecture and a collective noun for a co-operative group of people), in Hackney Wick, east London. The site is Queen’s Yard, immediately adjacent to the Lea Navigation’s Hackney Cut which borders the future 2012 Olympic Park. 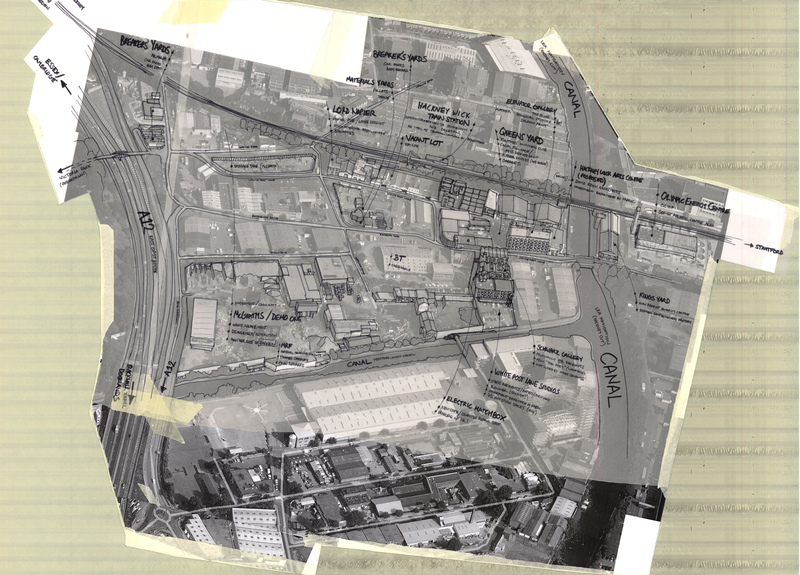 Originally conceived as a critique of legacy in the Olympic development, the Yard provides a point of expression for the vital communities active in Hackney Wick – artists and other alternative culture groups, craftsmen, breakers and community gardeners – who are familiar with a culture of transformation, re-use, and making the most of what they have. 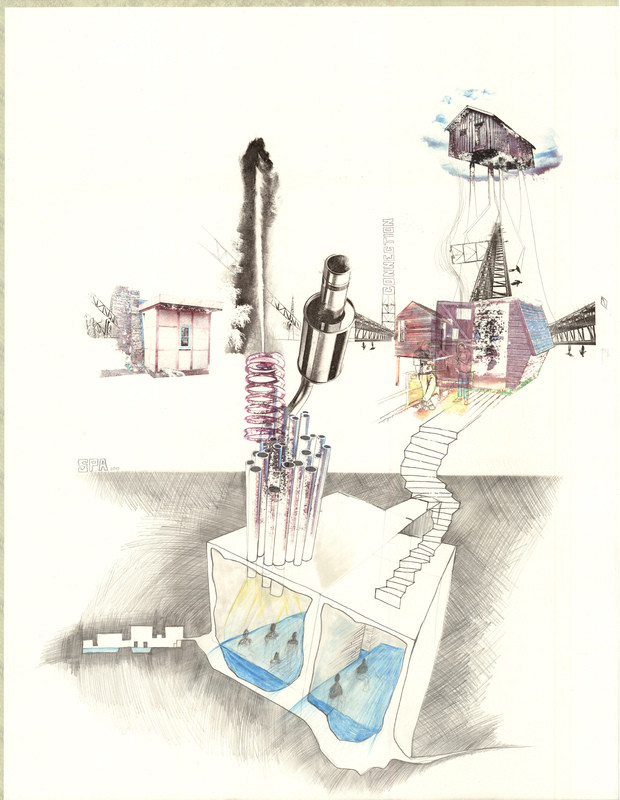 It considers education and learning as a personal reading of transformation and regeneration, and proposes that an interpretation of the Yard as a school (based around the core activities of making things) offers the opportunity to sustain this vital culture through the pressure of vast, imposed ‘regeneration’. 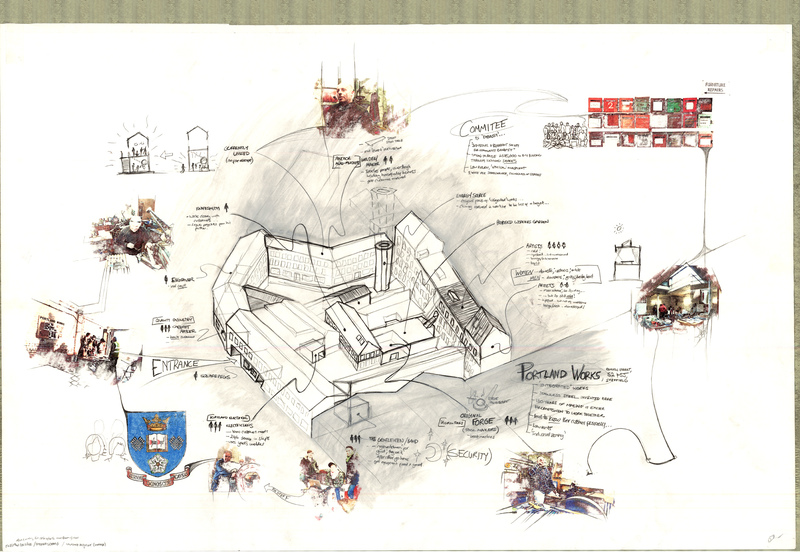 The montage below represents The Yard,as an architectural idea. The process of montage using laser printed photographs, pencils and inks is engaged – its get me away from the computer and out into the air – which underpins my thinking for this project. This particular drawing explores and illustrates the idea that what you don’t draw is sometimes as telling as what you do. The flexible, affording qualities of a Yard for interaction between tenants – for ‘soft space’ and indeterminacy – are simply not physically ‘designed’ in the normal way. 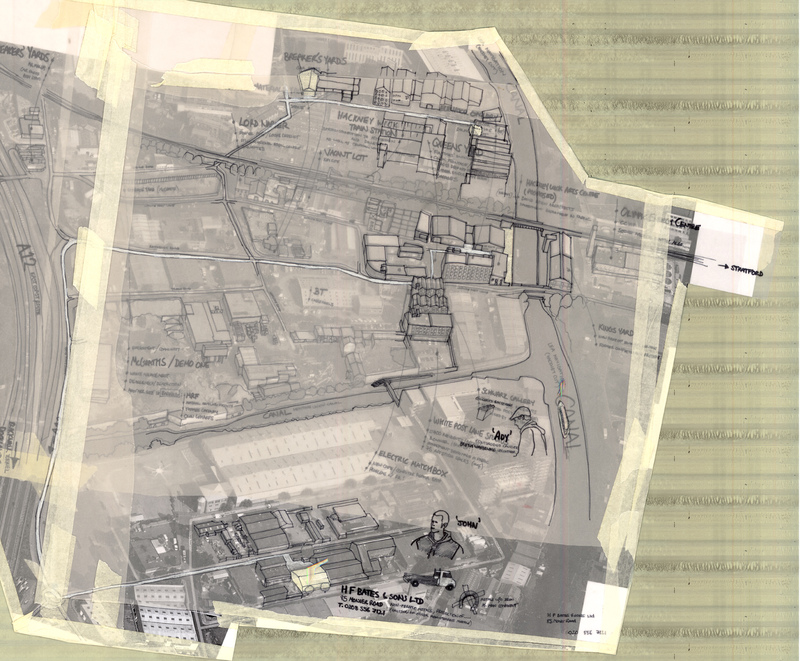 The buildings around the yard are interfaces and the unbuilt space between them shares equal architectural importance. The Mint considers the role of finance and exchange in underpinning a productive economy and how the typology of institute emerges from the genesis of currency. We have become divorced from a physical relation to that which measures production and by derivation experience a reduced frequency of face-to-face encounters accompanying the contract of exchange; the same encounters that build relationships and strengthen communities. An aspect of my project will explore mechanisms by which these encounters can be instigated and perpetuated. Following the review, we discussed how the term ‘Mint’ might be restrictive in relation to the intent described above – perhaps exchange is better facilitated by the typology of market? The concept should be redefined in terms specific to this project, but remain as a catalyst for thought. How can economics catalyze the vitality and educative processes happening in the Yard? 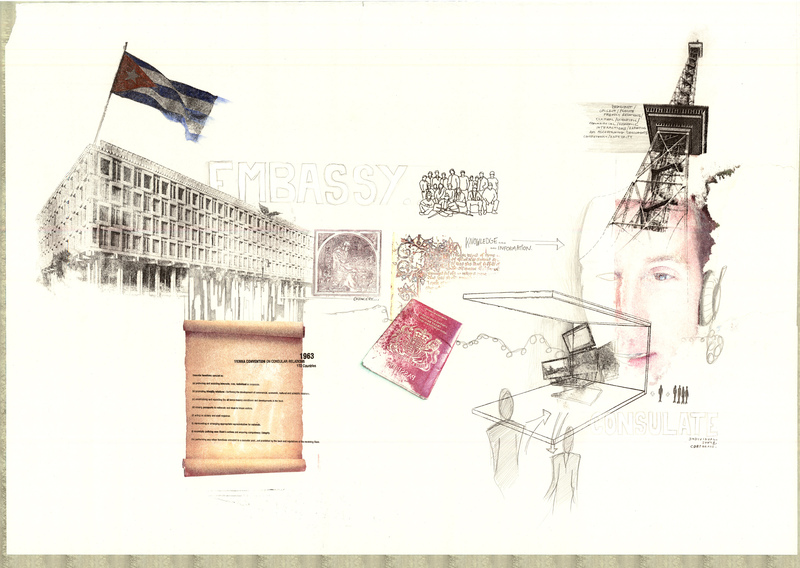 The collage on Embassy explored the idea of a functionary that regulates encounter with the Yard. Upon dissection, the term Embassy actually refers to a group of people – the Ambassador and his entourage – rather than to a building typology, which is in fact termed the Chancery. It is interesting to note that a Chancery is also the term given to the office where monks of certain religious orders engage with writing and record keeping. Therefore, the Embassy perhaps has a role in the Yard as the point of reference for those wishing to interface with it, and as a literal facilitator of the exchange of knowledge. If termed more appropriately as Consulate, this agency represents a valve through which the flow of resources is regulated (an Embassy both issues visas to incoming aliens and passports to outgoing nationals). Architecturally, the Consulate may need accommodating and the requirements of this will be explored further as the tenancy of the Yard evolves. The Spa was introduced initially as literal programme with the intent of exploiting the historic tradition of social, public bathing in the Borough of Hackney, the aquatic amenity of the Lea Valley and the surplus hot water produced in Combined Cooling, Heat and Power (CCHP) generation at the Olympic Energy Center sited just across the canal from Queen’s Yard. However, the Spa has actually come to allude to a less literal role in the experience of learning – the importance of reflection and juxtaposition. It also refers to the importance of casual exchange in ‘piecing things together’ and even to trust implicit in contractual agreements. There is the idea that in other places, different activities take place in Spas – most notably, Swedish business deals are sometimes made in the sauna when, being naked, you have nothing to hide. Restoration, regeneration, personal ‘growth’ through transformation, re-learning the link between mind and body, perception and embodiment – all are alluded to by the Spa as a programmatic element. Thus the Spa has come to represent the idea of a ‘change of state’. Simply being somewhere else affords different perspectives which through juxtaposition reveal aspects of self and ones own situation. Thus the literal programme of Spa may remain, all be it on a smaller scale and by a different name to that which it began. I simply want to explore the way embodied juxtaposition and difference can support social interaction in an environment conducive to learning through doing. Again, the term ‘Spa’ is perhaps restrictive and should be redefined in terms appropriate to this project. Considering British Waterways as a tenant gives me an opportunity to introduce an aquatic element to the programme. Through revitalization of the waterways, and under its remit to diversify their use British Waterways’ network of volunteers could use the section of canal bordering Queens Yard to demonstrate work that returns it to a state fit for bathing. 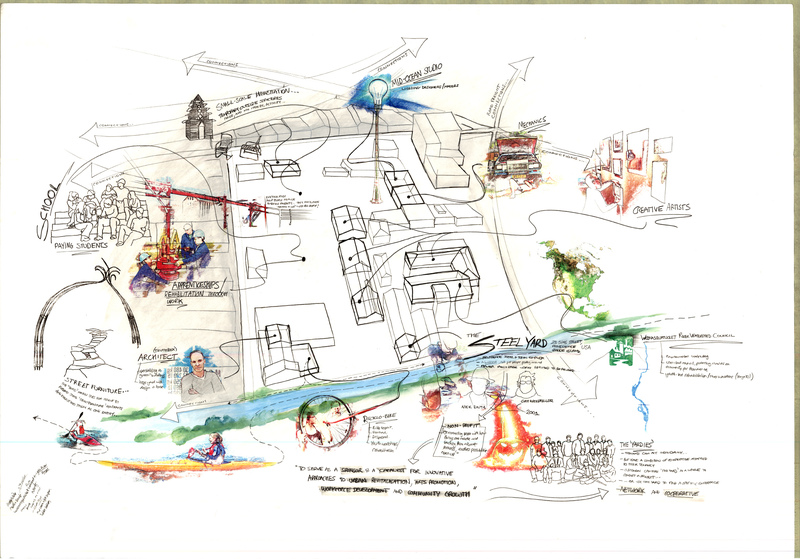 Elements of this project are appropriate to explore through case studies of precedent assemblages and organisations. Below is the example shown previously for Portland Works in Sheffield. 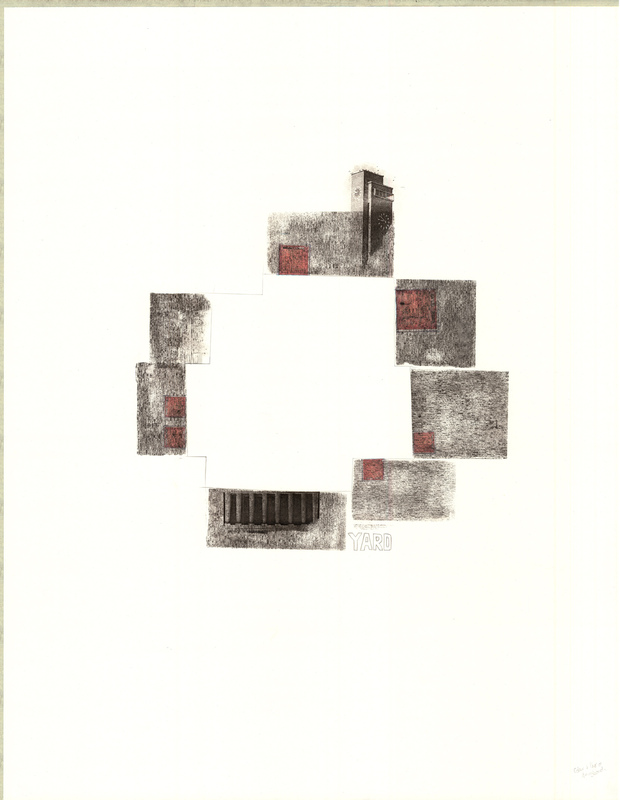 In these studies I am interested in exploring a drawing style that communicates the complexity of spatial, social and material assemblages that underpin the condition of the Yard. 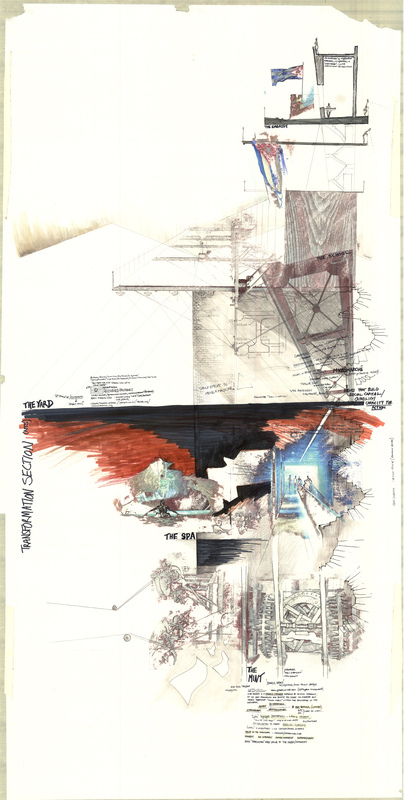 The previously explored precedent of the Steel Yard in Rhode Island, US is re-worked in this drawing style to illustrate the particular assemblages comprising that condition. The assemblage technique is then applied – in several stages and different scales – to Queen’s Yard at Hackney Wick, to pull out existing tenant offering potential to the project. – 3 specific scenarios, based on existing tenants, that re-imagine their condition as learning situations. Drawings will add a different layer to the montage drawing method, developing the methodology through which I am exploring my project. – Personal Manifesto, exploring and stating what I would like to get out of the rest of 5th year. – Assemblages, to set up a discussion of the spatial, social and material conditions of my project as they evolve, considering them as interdependent networks. I am pleased with the methodology that I am developing for this project – of fundamental importance is the fact that it gets me away from the computer and makes me engage with physical material and process. I believe this supports the very ideas I am trying to explore with this project. The collages presented in this post represent the first chapter of programmatic exploration. 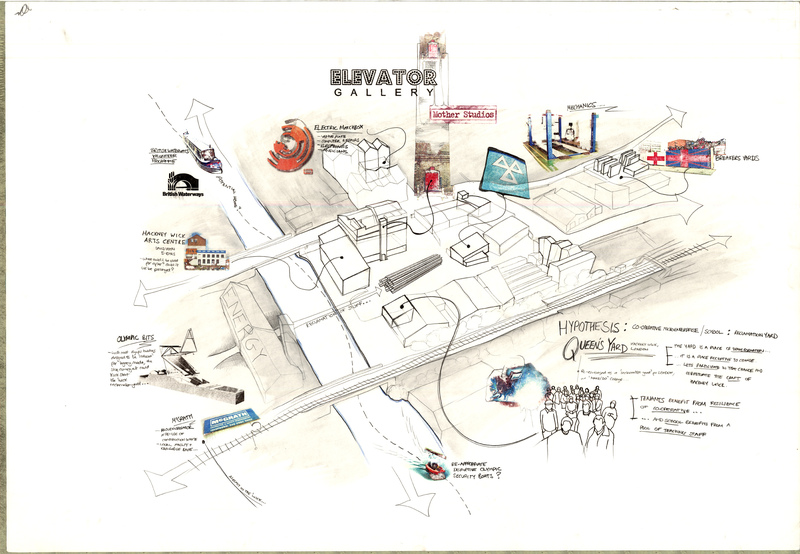 The next chapter will be an evolution of the same technique, adding a layer of specificity by appropriating real, physical spaces that can be represented in the drawings. The technique lends itself to the duality of complexity and simplicity that is a condition of the Yard. Very specific determinacy of tenancy and activity is complimented by the indeterminacy of the spaces between buildings. Both are important. This is good.Yes, a detailed study of the van is also needed. 1. 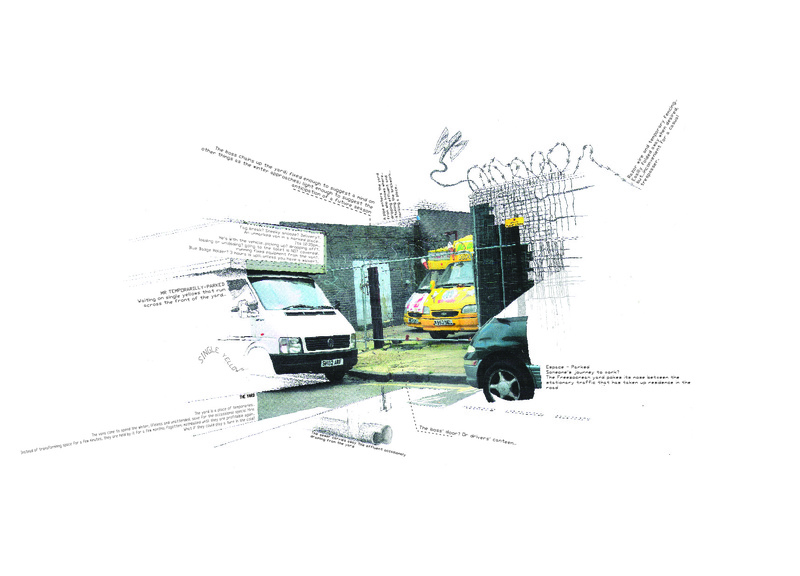 Zoom out – you need to study this condition from a slightly larger distance – one where you cansee the context of the space AND start to draw the vans migration out from the site across eastLondon. How does the situation you are looking at fit in with the immediate context? I have got to sayan axo would be good for this. Figure out how to draw one in a quick way (simple sketch up > print >hand trace?) then layer up all of your thoughts onto it. 2. You have explained the informal reading very well. Compliment it with the formal version of eachsituation or observation.Once you have done these 3 things (two above plus the van study), you need to review all the themesand issues that you have raised (clearly state what your intervention will be about) and then work onproposing an intervention that disrupts or changes things, as discussed. 5/ Montage directly engages with modes of representation outside of the discipline of architectural design, through the appropriation of procedures and images taken from the world as a whole. 6/ Although Industrialisation has produced a fragmentation of experience and perception, it has also…created the means by which the world could be comprehended and reconstructed.